Join us. The Cause is good: Come to Richmond on January 30th to meet with your legislative representatives and advocate for the common good! Members of our Advocacy Network play a crucial role in bringing the Gospel to bear on public policy issues in the Commonwealth. Members of the General Assembly often tell us that hearing from their constituents affects how they vote on critical issues. And while email contact is easy and effective, nothing beats the impact of a face-to-face meeting with Delegates and Senators about issues important to you as a Catholic. 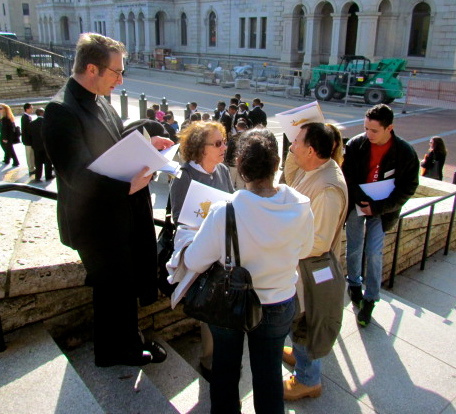 Make plans and register now to join Virginia’s Bishops and the Virginia Catholic Conference at the annual Catholic Advocacy Day in Richmond, Thursday, January 30, 2014. Catholic Advocacy Day is an opportunity for Commonwealth Catholics to come together in the Virginia capital to urge lawmakers to protect life and the family, assist the poor and vulnerable and work for justice. The day begins with registration at 8 AM and ends at 1:30 PM. Register here. Your presence makes a difference! Watch this short video for highlights from previous Catholic Advocacy Days. The Conference invites Advocacy Network members, parish groups, Catholic schools and other interested individuals to attend. Arlington Bishop Paul Loverde and Richmond Bishop Francis DiLorenzo will offer welcoming remarks, followed by prayer, briefings on priority issues the Conference will be advocating this General Assembly session, caucusing with other advocates and scheduled visits to legislators’ offices. Lunch and Mass will follow. We look forward to seeing you in Richmond on January 30 for Catholic Advocacy Day 2014!